Captain Renault: Rick, there are many exit visas sold in this café, but we know that you’ve never sold one. That is the reason we permit you to remain open. Rick: Oh? I thought it was because I let you win at roulette. Captain Renault: That is another reason. Rick: Why I’m so lucky. Why I should find you waiting for me to come along. Ilsa: Why there is no other man in my life? Ilsa: That’s easy: there was. And he’s dead. Victor Laszlo: I know a good deal more about you than you suspect. I know, for instance, that you’re in love with a woman. It is perhaps a strange circumstance that we both should be in love with the same woman. The first evening I came to this café, I knew there was something between you and Ilsa. Since no one is to blame, I – I demand no explanation. I ask only one thing. You won’t give me the letters of transit: all right, but I want my wife to be safe. 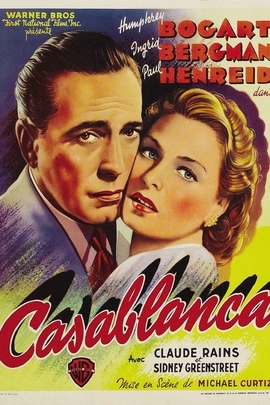 I ask you as a favor, to use the letters to take her away from Casablanca. Victor Laszlo: Apparently you think of me only as the leader of a cause. Well, I’m also a human being. Yes, I love her that much.